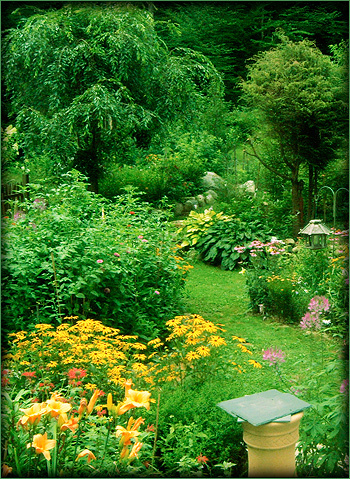 A personally designed garden is the perfect opportunity to add an abundance of color into your landscape. Annuals (flowers that survive only one year) are your best bet for providing the most vibrant color and if used properly can make quite a statement to any visitors to your garden. Perrenials are another flower alternative. Perennials are a more cost effective way to add color to your landscape since they grow back year after year. Perennials are also a great way to add color to your garden for the entire growing season in sun, partial sun, and shade. Once paired with annuals, the combination of perennials and annuals is the perfect way to establish a beautiful garden. Decorative trees, flowering trees, ornamental shrubs, and trees are additional features to add to your garden design. Flowering trees and ornamental trees are an additional option in adding a "pop" of color to your landscape. Mulching, fertilizers, hydration, and garden preparation are very important in achieving a beautiful garden. We use organic composts, soils, and mulches to nourish all your plantings with our garden plantings and maintenance. A successful and beautiful garden starts with a great plan. We provide extensive garden designs/plans to make sure our customers achieve a garden with excellent color, balance, texture, blooming schedules, and COLOR! We work with all the local nurseries to provide all the best options in annuals, newest selections of perennials, and fabulous shrubs/trees. We can also plan your vegetable gardens. If fresh produce is important to you, then a vegetable garden would be great idea for your yard. gardens please visit our galleries page. Links to our other landscape service pages.